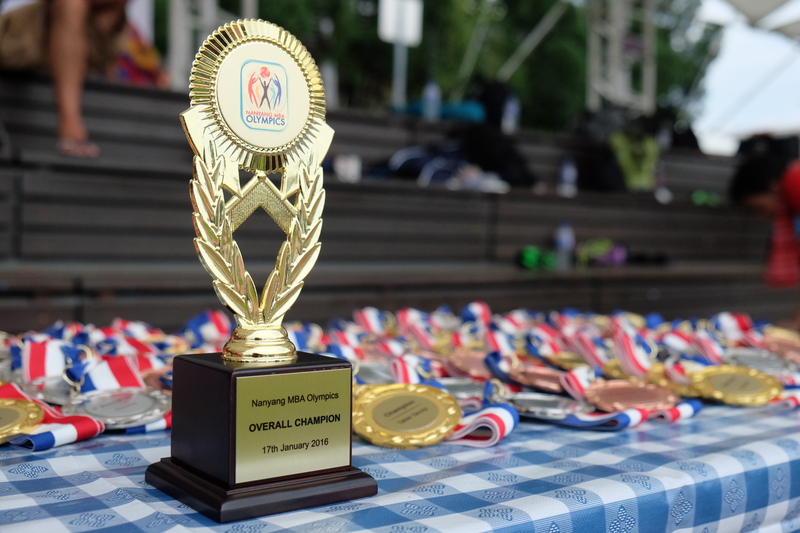 After the success of the MBA Olympics, here comes another event for our NBS soccer team: A prestigious soccer tournament organized by HKUST, where schools from all over Asia are competing for one common goal: the trophy! 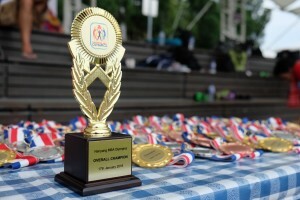 The entire NBS team is very motivated to participate in this great tournament and every player is excited to represent Nanyang Business School once again in a interscholastic sporting event. 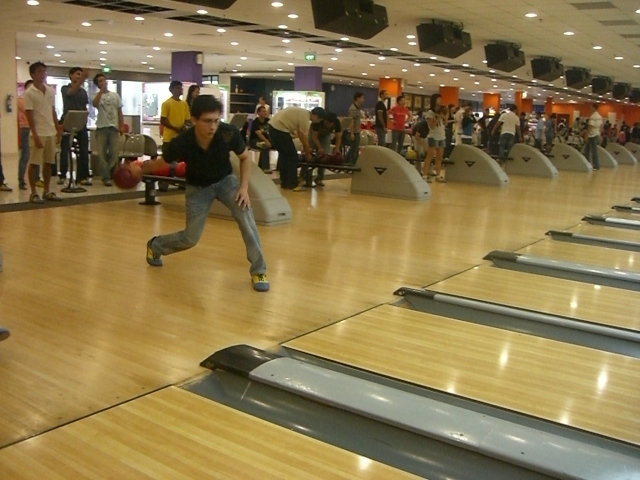 To get ready for Hong Kong, the sports club organises regular practice sessions, during which the team focuses on improving endurance, moves and skills. 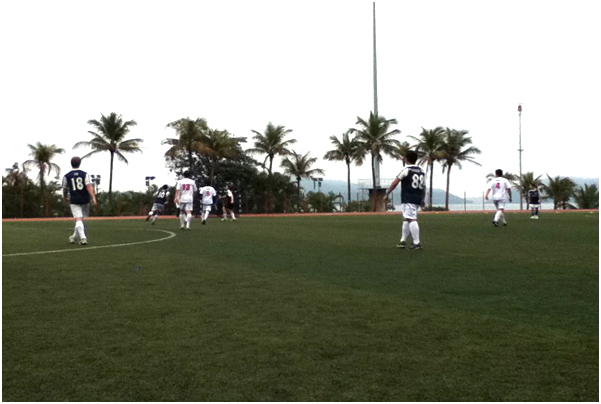 As part of the tournament preparation, the NBS MBA team played a friendly match against the RSIS batch. 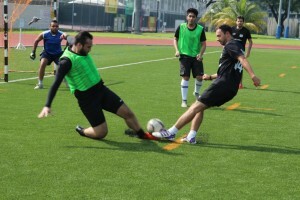 The game was a great learning experience and enabled the players to apply some of the skills developed during practice. It was a fantastic match with a lot of fun on both sides, which will likely be repeated in near future. 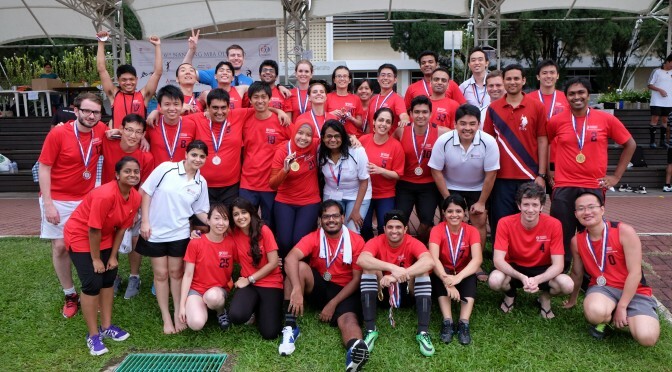 The NBS MBA team vs RSIS team – a friendly match! The vaguely bright Sunday early morning of 18th March at the NTU Sports & Recreation Center came in with a flurry of activity: banners being hung, tables carefully unfolded, balls being rigorously pumped with air, heaps of goodie bags and canned drinks unloaded. 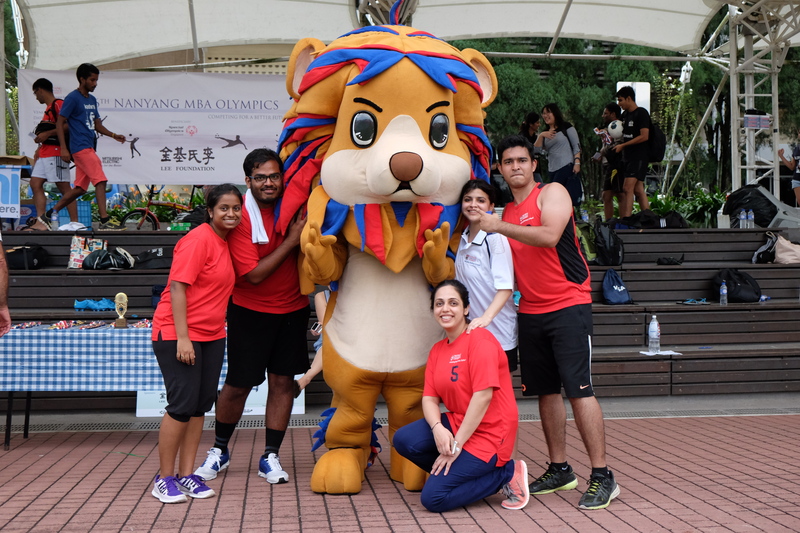 At 9:00 AM, groups of participants from various Singapore MBA schools came in droves to register, collect goodie bags and start stretching exercises in preparation for the long day of sports. The morning was filled with anticipation, excitement, and a sense of hopefulness that the typically unpredictable Singapore weather will keep the athletes dry and cool. 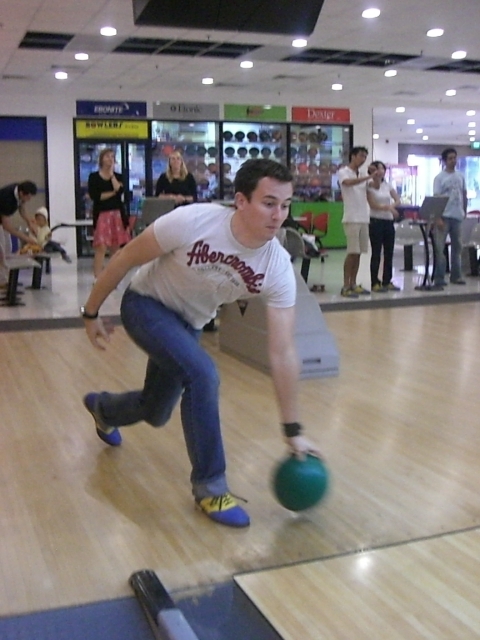 What started as a friendly warm up among thirty MBA students turned into a healthy competition of strikes and spares between teams of three! 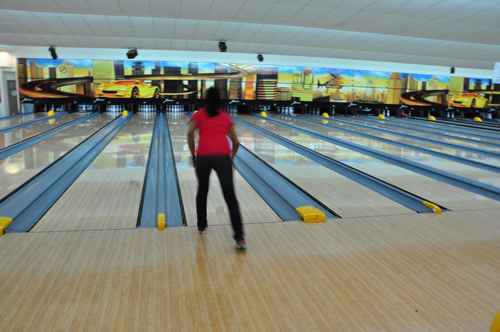 Bowling between the MBA students! 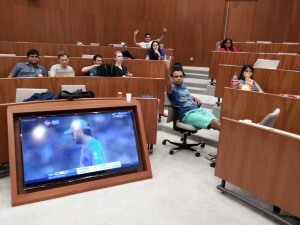 It was exciting to watch, many of us just couldn’t sit down. 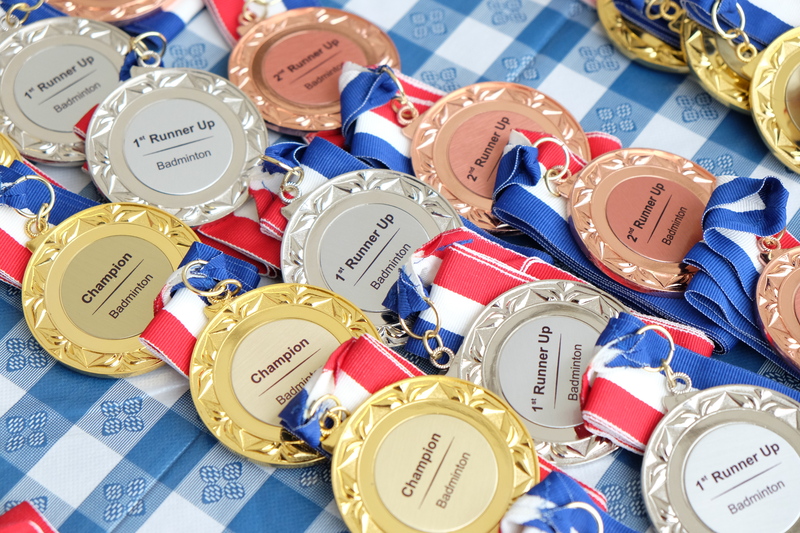 Though we didn’t know when our competitive spirits kicked in, we were all in the same frequency through out the competition. The teams displayed their skills, and gusto. Sure, some were better than others but from where I was standing, we all had an equal share of fun! 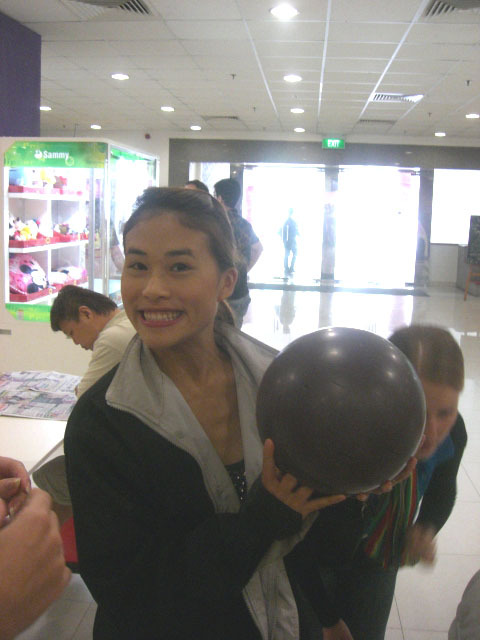 Esmond and Tai took down bragging rights as the top male and female bowlers of the day. This gave their teams crucial advantages in the competition and they played a really good game. I think, even if you weren’t playing, it would still be pretty interesting to watch. For example, Rob, “Mr Consistency” actually scored 132 in all the three games he played. I am not entirely sure of how he managed but the coincidence in itself earned him the name. Nino claimed the title of “Mr High-Score” because he scored 161 in his second game and was undefeated for the rest of the day. To the thirty of us who went, it’s been great fun and I do look forward to doing this sometime soon again. This time, maybe I’ll claim one of those titles and keep it for myself! Looking at this photograph will probably always succeed in making me smile. After all, we made it to the semi-finals as a team this year! 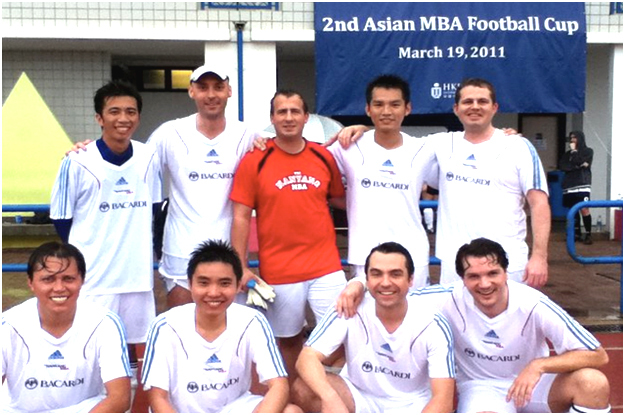 HKUST hosted other football teams from INSEAD, CEIBS, HKU, HKCU in this rough but thoroughly enjoyable one-day tournament. Our team was drawn in a group with HKUST Team 2, HKUST Alumni and HKU where our very own Italian stallion Henri Allegra scored 2 goals to take us into the semi-finals. 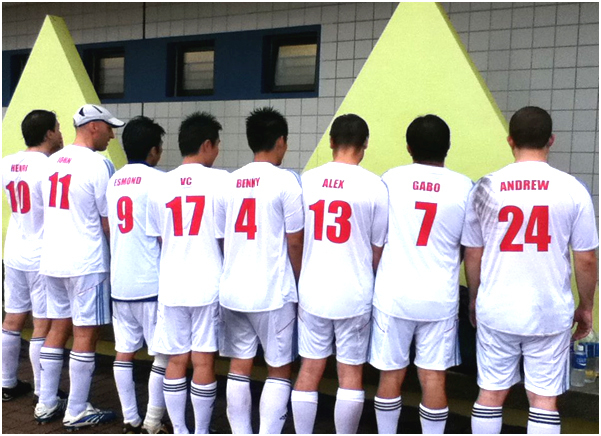 However, having the smallest team of only 9 players took its toll on us. Henri, Alexander, Gabriel, Andrew, Vincent, Benny, John and Rob – we all just had each other to lean on against some very skilled players. We really were at a disadvantage. We lost to match the eventual champions, INSEAD. Still, we don’t walk away from this experience disheartened. We’re far from that, actually. The team showed great sportsmanship despite injuries and the rain. There really wasn’t room for defeat anyway, because at the after-party, everyone felt like a winner. We went to Republic, a posh club in Hong Kong’s Lan Kwai Fung district, a generous treat by the host! After all that hard work and good play, we were sore everywhere by the end of the trip. We still find the experience worth it though. 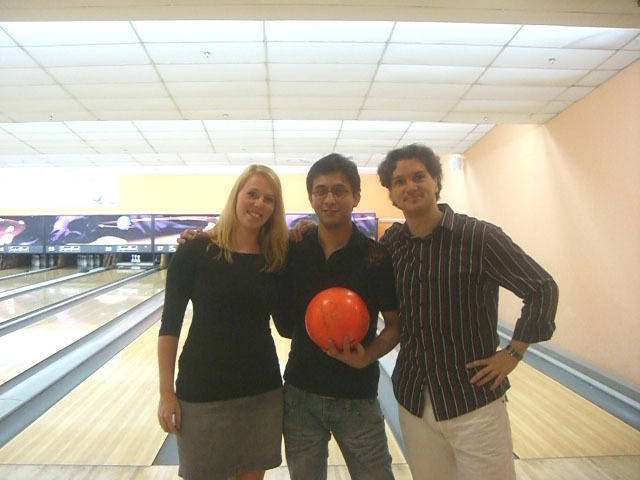 It was great fun to compete and at the same time, we got to network with other MBA students of different nationalities. The best part was getting to bond with each other and functioning as a team. I really feel like we did win a great prize and we’re walking away with it. This prize, to me, is invaluable. This event led me to meeting some great individuals indeed, and I relished every step of the way. We definitely scored, if you ask me. second Youth Olympic Games (YOG). a better future through the promotion of the Olympic ideals. 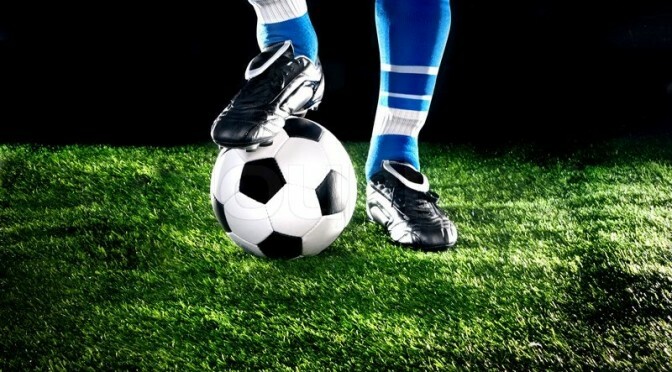 is also internationally recognised for its integrity and commitment to fair play. 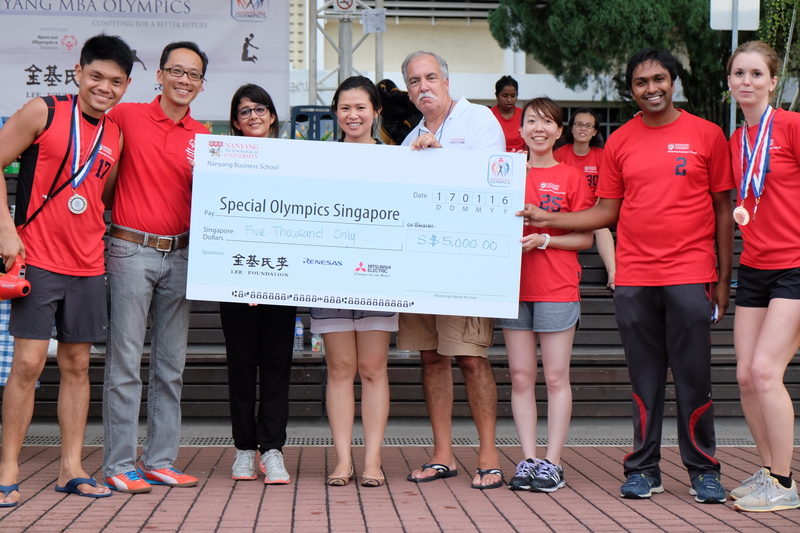 Over the next two years, Singapore worked hard in preparation for the big day. 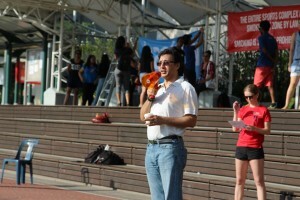 journey in hosting the YOG. athletes are slated to compete in these sports comprising 201 events. Olympic Village, also known to NTU as a ‘Garden, Village, Home’ was created. to create the best home-away-from-home living experience for them. stunning backdrop of Singapore’s Marina Bay. by the Belgian since he became the Olympics chief in 2001. Let’s recap some exciting sporting moments of YOG 2010.